Our Trace Heating division design, supply and fit all aspects of Trace Heating including Commercial, Industrial and Residential Trace Heating Systems, Underfloor Heating, Frost Protection systems and all types of Leak Detection Systems including Water Detection, Oil Detection and Acid Detection Systems. 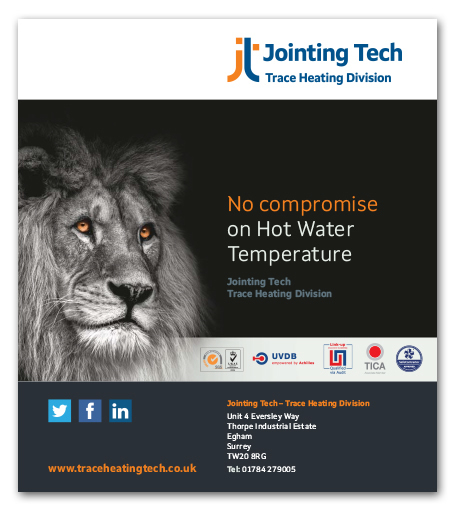 With a UK wide network of experienced installers and more than 30 year’s knowledge in designing, supplying and fitting all types and sizes of project, your trusted team at Jointing Tech - Trace Heating are on hand to help make sure you get the best results for your unique needs. For more information on our free quotation and installation services or if you have any technical queries regarding an existing product, new order or just a general technical question we will be more than happy to assist you, please contact us.